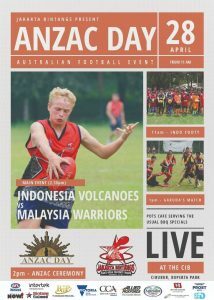 Anzac Day is a day of commemoration and remembrance for those who proudly fought and died whilst serving Australia and New Zealand. 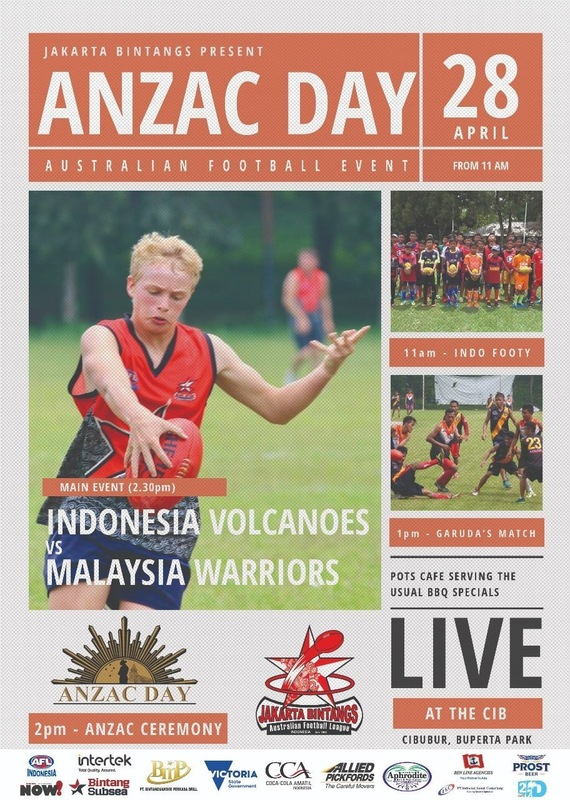 In recent history, Australians have patriotically come together more than ever to pay their respects and to embrace the Anzac spirit. 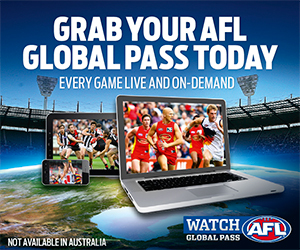 The nation also celebrates Anzac Day and its importance through a variety dedicated sporting codes, which will be evident this weekend as the AFL celebrates Anzac Round, culminating in the annual Anzac Day clash between Collingwood and Essendon at the iconic MCG. 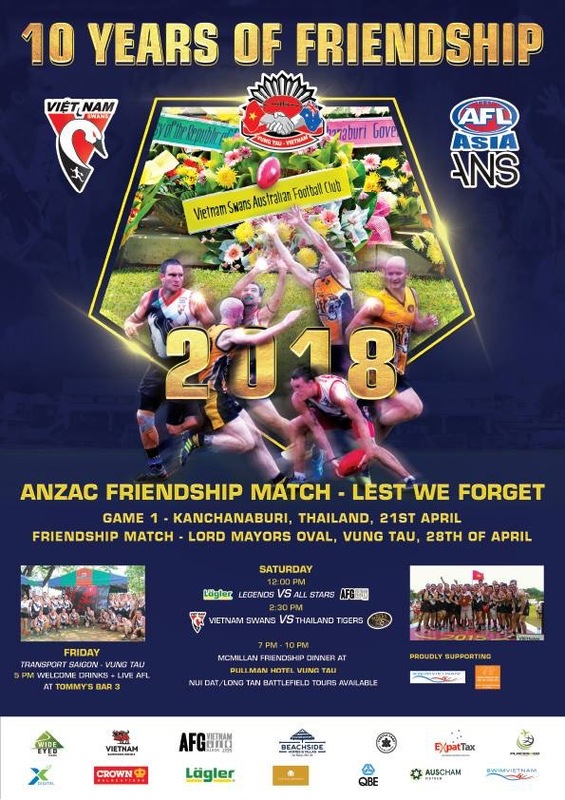 War has also been prevalent and scattered throughout the history books within Asian countries and it is with great pride and honour that AFL Asia sides will be embracing the Anzac Day spirit through scheduled matches and tournaments over the next two weekends. 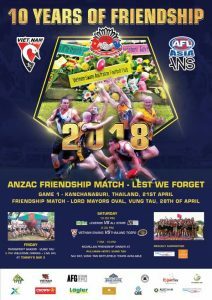 The return match will see the Vietnam Swans hosting the Thailand Tigers on Saturday April 28th in what will be a Anzac Friendship Match, whilst also celebrating the ‘10 years of Friendship’ between the two sides and the 9th time that the Swannies have hosted ANZAC Friendship Matches at Vung Tau. 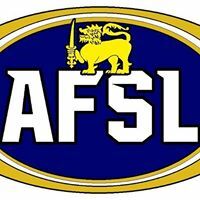 The Anzac Friendship Match will be played at the Lord Mayors Oval, Vung Tau with the ‘Lagler Legends’ kicking off proceedings against the ‘AFG All-Stars’ at 12:00pm in what could be classified as your typical ‘Slowdown’ of Asian footy talent. 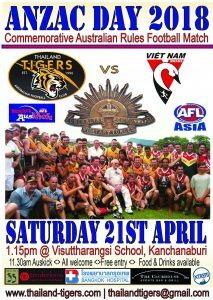 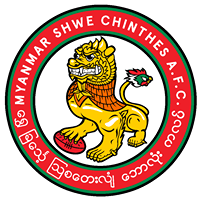 The showcase Anzac Friendship Match between the Vietnam Swans and the Thailand Tigers will start at 2:30pm, in what promises to be a cracker match with some bragging rights on offer for a couple of the bigger Indochina clubs after the return leg of the 2 weekend games. 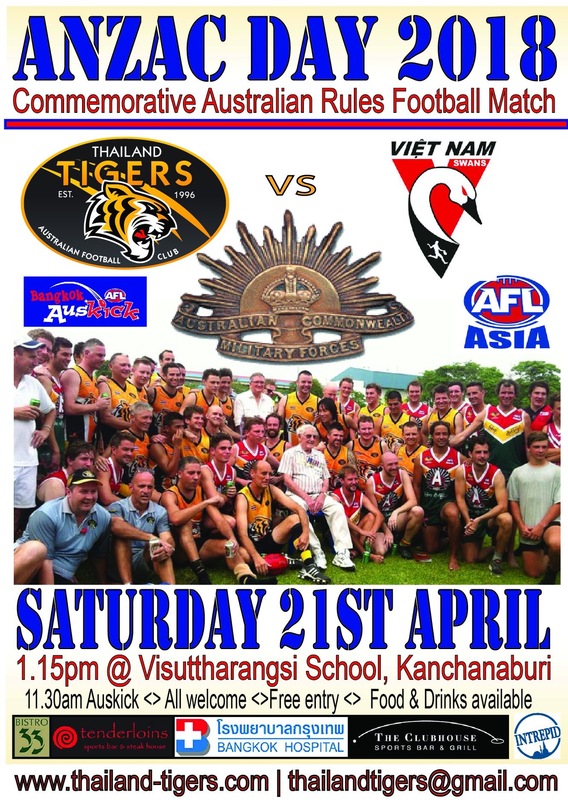 Both Kanchanburi and Vung Tau are significant locations when reflecting upon Australia’s involvement in past battles. 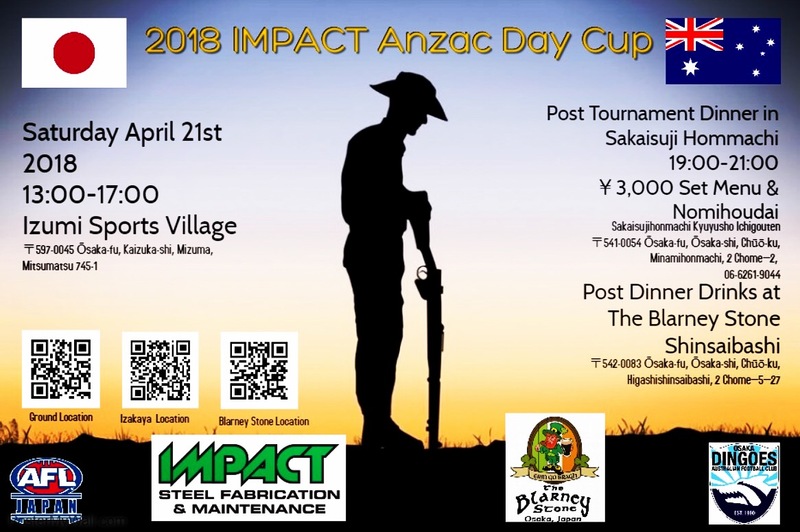 The reality and presence of war is a stark reality in Kanchanburi where thousands of Australian prisoners of war (POW) built the Burma Railway in World War II. 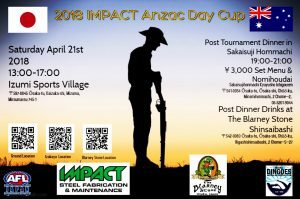 The Kanchanburi War Ceremony allows visiting Australian tourists to embrace up the Anzac spirit and reflect on those who admirably served our great country. 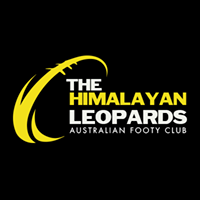 During the Vietnam War, the 1st Australian Logistics Support Group was headquartered in the coastal location of Vung Tau, as were various US militant units at different times. 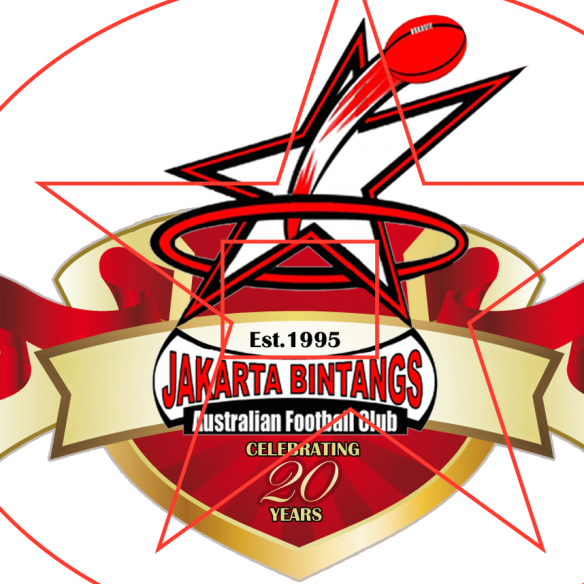 The Jakarta Bintangs will play hosts to a massive Anzac Day clash between the Indonesia Volcanoes (Jakarta Bintangs and Bali Geckos) and the 2017 AFL Asia Champions – The Malaysian Warriors on Saturday April 28th at the CIB – Cibubur, Buperta Park. 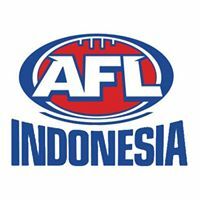 The Indonesia Volcanoes will be a force within AFL Asia footy circles throughout the 2018 season if they continue to play under the one banner as the Jakarta Bintangs have always been competitive and almost unbeatable on home soil, whilst the Bali Geckos are the current AFL Asia Division 2 back-to-back Asian Champions. 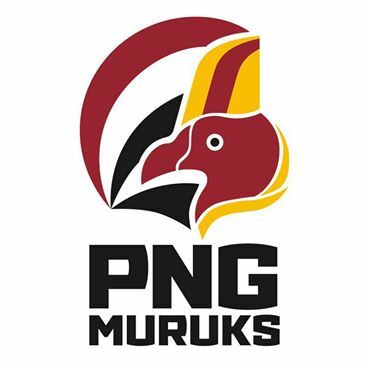 The Malaysian Warriors have had a sluggish start to the year after last year’s breakthrough triumph and celebrating their 25th year anniversary, in what was the biggest year in the Warriors proud history. 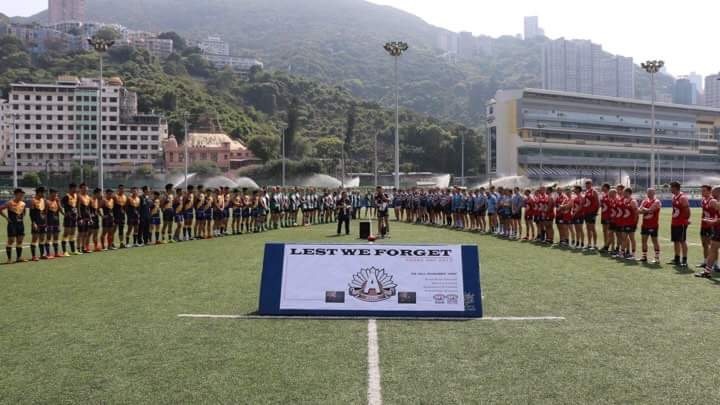 Round 2 of the Port Adelaide Power sponsored Southern China AFL sees an absolute blockbuster of scheduled games with the Hong Kong Dragons playing hosts in this weekend’s Anzac Round to be held at the Stanley Ho Sports Ground, Sandy Bay on Saturday April 21st. 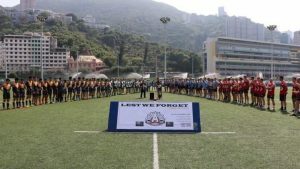 An official Anzac Ceremony will get proceedings underway at 1:00pm, with local sides the HK Lantau Lizards and the HK Typhoons playing the first game of Round 2 action from 1:15pm. 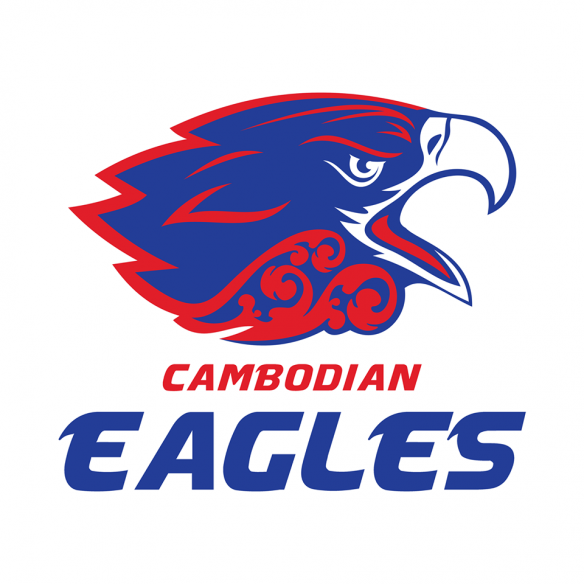 The Huizhou Hawks take on the Guangdong Seagulls from 1:50pm, followed by the HK Typhoons and the recently successful Guangzhou Scorpions at 2:25pm. 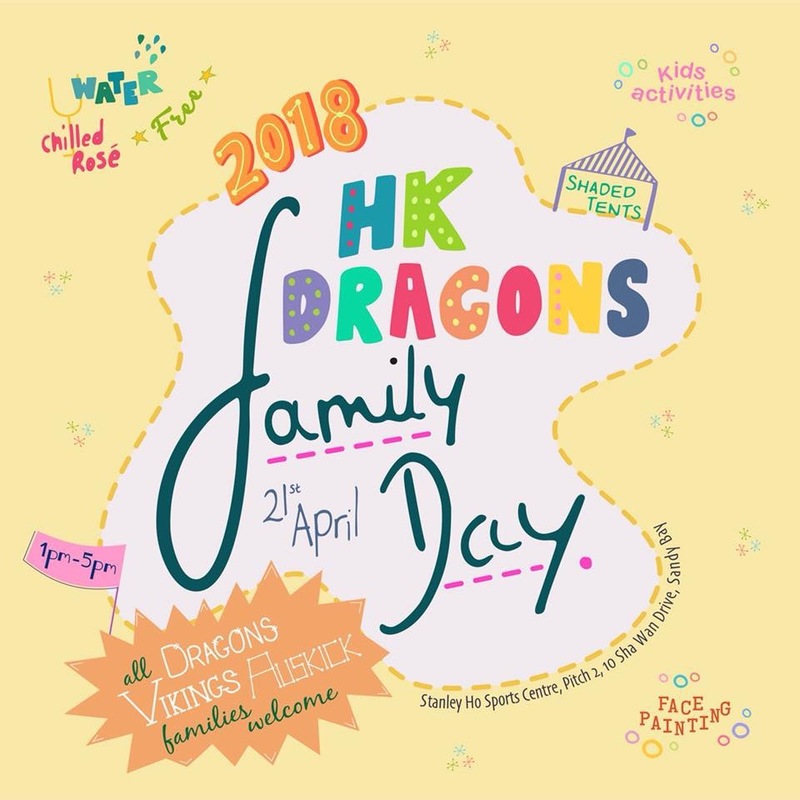 The Guangdong Seagulls will battle it out against the HK Kowloon Cobras in the Cobras’ first match of the day at 3:00pm, whilst the Huizhou Hawks and the HK Typhoons will play their second matches of the day at 3:35pm. 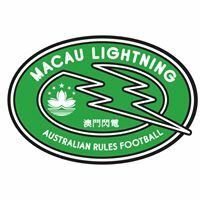 The Guangzhou Scorpions are set to face the HK Lantau Lizards in the 4:10pm time slot, which will be the prelude to the Hong Kong Vikings facilitating an Auskick Clinic at 5:15pm prior to the final encounter of the day, which sees HK Kowloon Cobras taking on the Huizhou Hawks in their third match of the day at 5:45pm. 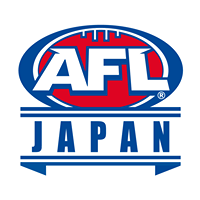 It’s going to be a gigantic two weeks of Anzac Day footy within AFL Asia, so get behind your club’s fortunes and always remember – Lest We Forget!